Fast Eddy O first wrote this article for Flandria Cafe in February 2010. The Greatest Cycling Team Ever? You'll get a lot of debate over that one. Every era has its usual suspects. The 80's? The Dutch TI Raleigh squad (Raas, Knetemann, Zoetemelk)? Renault-Gitane (Hinault/Fignon/LeMond/ Madiot)? Or maybe LaVie Claire (Hinault/ Lemond/Bauer)? 90's? Had to be Mapei (Rominger/Museeuw/Tafi/VDB/Ballerini) or was it Miguel Indurain's Banesto? The past decade that saw Lance's US Postal juggernaut morph into Discovery and then Astana? Or CSC/Saxo Bank? For 20 years (from 1959 until its namesake patron bicycle manufacturer went bankrupt in 1979) Flandria was to Belgian cycling as the Steelers were to Pittsburgh (American) football. The reference, the summit, End of discussion. First there's the roster. The legends who rode for the "Red-Guard" reads like a laundry list of cycling's greatest riders. No other team ever featured so many different champions, over such a long period. It started with Joseph Planckaert. 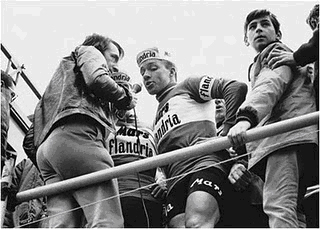 Then came 'the Emperor' Rik Van Looy (the first man to win all the traditional Classics). His Flandria mates were Ward Sels and Noel Fore, Dutch Six Day star Peter Post, the great Walter Godefroot (the bulldog of Flanders). The first Dutch Tour de France winner Jan Janssen rode in red for awhile near the end of his career. As did Herman Van Springel, loser of a heartbreaker '68 Tour to Janssen, consoled as king of the now-defunct motor-paced classic marathon Bordeaux-Paris. Cyclocross and Classics stars brothers Erik and Roger DeVlaeminck. A neo-pro named Joop Zoetemelk. 3 time 'Ronde' winner Eric Leman got his start there too. Then there was Jempi Monsere - the James Dean of Belgian cycling. Jempi was a prodigy who was 1970 World road champion in Leicester England. He was tragically killed the next spring in a crash against a car driven the wrong way onto a kermesse course in Retie. There were Flemish hard-men like Andre Dierckx and Johan DeMuynck. Cyrille Guimard (the French sprinter with bad knees who became a 'champion maker' by directing Lucien van Impe to a Tour de France win in 1976, and then discovering Hinault, Fignon, and some American teen named LeMond). Flandria even put Portugal's Joachim Agostinho on the Tour de France podium twice in his late 30's. Most famous of all, the team birthed the career of Freddy Maertens who was virtually unbeatable in a sprint and won almost everything during his peak years. His supporting casts were no slouches either. Michel Pollentier stepped up to win a Giro D'Italia in '77 after leader Maertens crashed out. 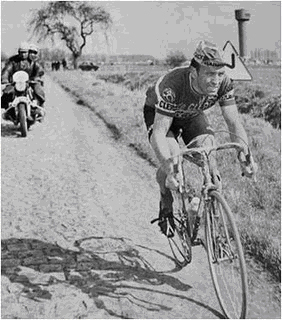 Marc DeMeyer similarly won Paris Roubaix, a ride made famous in the famous Jorgen Leth documentary 'A Sunday in Hell'. Close to my own heart, a young Irish pro named Sean Kelly got his start at Flandria - a team where there was none of the nationalistic prejudice you'd see in the French, Italian or Dutch teams. If you could work, suffer, perform and still laugh you were accepted for who you were, not where you were from. Well, there's the breath of ‘race-types’ they were competitive in. Flandria didn't specialize in Classics or Grand Tours like most teams today, THEY raced 'em all – across the board, and played a lead role in any race they took on. They had three World road race champions. Classics by the boatload, year after year the Giro? the Vuelta? Check. Paris-Nice? Bien sur. Roubaix? Oui, monsieur. In total, Flandria at some point won every race except the Tour de France, and I still say Pollentier would have taken it in '78 if he hadn't been caught tried to cheat doping control at Alpe d'Huez with a bulb of somebody else's urine under his arm. His mate Maertens had won 8 stages and the Green Points Jersey in '76 and was in the Maillot Jaune for half that race. Yes, even at the Tour Flandria was a force. Some say the organizers only threw Pollentier out because he was Belgian and the French were sick of those damn Belgians winning their Tour. Then there's the leader. Any team directed by 'Iron Briek' Schotte - the last of the Flandriens - deserves to stand at the summit in my book. Training in the sun of the Riveria? Screw that. Why bother when you can train 'a-la-flahute'. 200k in January, to the north sea and back. Wind, rain, snow and cobbles? Makes you sterk (strong). A raw egg in stout for breakfast. Steak and a beer in your musette. Back for vegetable soup and early bed and get up and do it all again the next day. Guillaume Driessens also had a tilt at the helm. Look up 'rogue' in the dictionary and there's a picture of Driessens. Big, verbal, manipulative and charismatic were all used to describe Driessens. Eddy Merckx hated him, thought he was a phony. So did the wives of most of his riders because he'd barge into their kitchens unannounced and try to teach them how to make minestrone. Yet he motivated and willed Freddy Maertens into a one of the greatest winning machines cycling has ever seen. There’s the tradition of consistency. 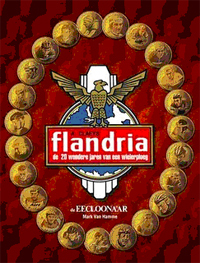 Flandria was a West-Vlaanderen institution: An artisinal bicycle factory owned by the hard working Claeys family that grew to a multi-location industry that expanded to mopeds, lawnmowers and even small motorbikes. Flandria mostly served the French and Belgian domestic markets, and kept the pro team together by cobbling together a budget from a constantly-changing succession of extra-sportif sponsors, and by being 'cheap-prick' Flemish about keeping rider salaries and other spending as low as possible. As a result, competition within the team was sometimes tougher than that faced with the opposition. At Flandria, riders felt honored - obligated even - to uphold a tradition. Fame and glory in the community was not an insignificant substitute for the ‘meagre diret’ financial reward. Because Flandria riders had to graft, hustle and angle for cash to supplement their salary the team had a strong Flemish culture of hard work for it's own sake. As a sports team, Flandria was neither flashy nor stylish, just consistently excellent. I've named Flandria Café (an internet wielercafe) to honor the memory of the Flandria team. I will add more stories from the Flandria years in the days to come. Just a few months ago, I snagged a great out of print Flemish book by Eekloonaar on the history of the Flandria team. Highly recommended if you can find one, even if you can't read Dutch. 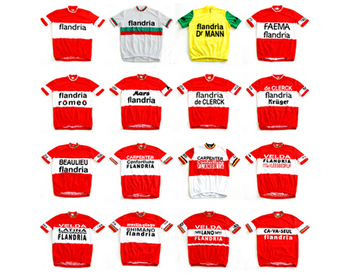 If I've peaked your interest in this great old team, here's where you can get your own Flandria. Flandria bikes are once again pounding the pave. Now a UK based company, Flandria is distributing frames and bikes currently in UK and Belgium. They’ve introduced a new 2011 range with 3 advanced models, in classic 'flandria' colors and graphics. Their new site is now up and running...check out these sweet rigs and read some more great bios on the riders of cycling's greatest team ever. SPECIAL NOTE: Pour a pint of your favorite Belgian Beer and join Eddy O at the "internet wielercafe" Flandria Cafe!! !